The sessions will START on Tuesday 8th December. Sessions are on Tuesday evenings from 8pm-9pm at Bristol Metropolitan Academy in Fishponds. In 2016 an extra session starts on 7th January at the Goals Soccer Centre in Brislington. This additional session will take place on Thursdays from 11am-12pm. Fishponds will be in the indoor sports hall and Brislington is outside on the 3G rubber crumb pitches. is also a chance to get back playing the sport you love that maybe you thought your playing days were over. And the football banter. Don’t forget the football banter. 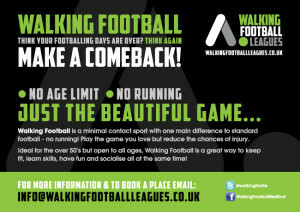 If you are interested in getting involved in walking football or would like more information, contact Peter Aitken on 0117 9522581, email peteraitken@bristolroverscommunity.org.uk.